2012 is off to a rocky start with the return of the dingos in a series of attacks similar to those in 2010. Alpaca security has been increased in an endeavour to prevent further stock losses. Regretfully we will release more of our herd for sale to further reduce numbers. Some great bargains are available, just email the address on the 'contact' page for details. 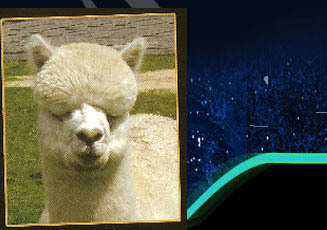 Starwood was pleased to host 2 fun packed days of alpaca activities for the 2011 National Alpaca Week. Thank you to all our visitors who attended on 1st & 2nd May to view our stock, watch the spinning demonstrations (using alpaca fleece of course) particpate in animal handling techniques and be enchanted in the 'Pat-a-paca' pen. 2010 commenced with a number of dingo attacks to our alpacas. We have been devastated by the deaths of a number of youngsters in daring daylight raids on the herd. All alpacas are contained in safe areas each night, however due to space constraints they are released to graze the paddocks during the day. Dog wire and Traps have proved useless against these cunning critters. We decided to reduce the alpaca herd numbers to enable better supervision and take this opportunity to thank those new owners for providing caring homes. Starwood Alpaca Farm is proud to be involved with promoting the Australian Alpaca Industry at a number of events over the years and 2009 was no exception. Attendees enjoyed the husbandry and animal handling demonstrations, free advice and alpaca products on view during National Alpaca Week earlier in the year. Farmers of the future were well catered for, with major educational days for students at Beaudesert Show 'Ag Ed' and Rural Discovery Day at the RNA Showground. Ipswich Agricultural Show gave us our first opportunity of the year to exhibit our show team and we were very pleased when all five alpacas exhibited at the show won either Champion or Reserve Champion sashes! The beautiful female 'Starwood Dream of Acacia' won Champion Adult female, building on her previous achievement of Champion Junior Female at this show last year. In August, Starwood Alpacas continued the tradition of supporting the Royal Queensland Show (Ekka) winning praise for their consistincy. Our final outing for the year was Gold Coast Agricultural Show. Yet again every animal in the show team did us proud with a swag of the ribbons. Higher awards were also gained with 'Starwood Dream of Acacia' winning Champion Adult Female, and the matron 'Starline Marina' was sashed Champion Senior Female and Best Fawn Exhibit.